I have decided to rewatch all my movies, which have Stephen King credited as "Original Material By" (there aren't many). I have to admit, that I have never read any of his books, so I cannot compare the movies to their source material. Prompted me to check in my collection and I was surprised the total for me is 12, well no, 10 (the other two are Screenwriter credits)... Looking forward to see which you own. Few movies capture the triumph of the human spirit as memorably as The Shawshank Redemption. Morgan Freeman and Tim Robbins star in this powerful nominee for seven Academy Awards (including Best Picture) based on a Stephen King story. Freeman plays "Red" Redding, a lifer who knows the ropes at Maine's Shawshank State Prison. Robbins is new inmate Andy Dufresne, a quiet banker unjustly convicted of murder. Andy's indomitable will earns Red's friendship; his resourcefulness brings hope and change to the entire prison. Andy is full of surprises - and he saves his best for last. Written and directed by Frank Darabont (The Green Mile), The Shawshank Redemption is an "engrossing, superbly acted yarn." (Tom Charity, Time Out Film Guide). Also worth checking out: The 25-minute short movie "SharkTank Redemption" which stars Morgan Freeman's son Alfonso in a parody of his father's role. This short is set in an agency's office environment instead of prison. It's great how they fit in dialog from Shawshank into this film. You started your marathon with a movie I have never seen! Don't feel bad...I've only seen part of it. Though I did think what I saw was great. I'm not surprised it is number one. It's a wonderful film and while it certainly isn't the absolute best, it's trick is that everyone can watch it. It's like Casablanca in that respect. Most films you can think of will only appeal to a target audience. If you don't like sci-fi or fantasy, that's Star Wars, Lord of the Rings out and any superhero in a silly costume, and if you're not fond of gangsters or violence in general, bang goes The Godfather, Goodfellas and Pulp Fiction, and thank goodness it isn't black & white or subtitled. Much as I hate to admit it, this is why Titanic is such a huge hit too. To dismiss any of them as populist is mean, but that's why they win. Christopher Walken stars in this tense, gripping screen adaption of Stephen King's best-selling novel, The Dead Zone. One fateful night, Johnny Smith (Walken) smashes head-on into an enormous truck. For five long years, Johnny is plunged into a deep coma. When he awakens, he discovers that his youth, his career and his fiancee, Sarah (Brooke Adams), have all been lost. But Johnny has gained something — extraordinary psychic powers allowing him to see visions of the past, present and future. In episode after episode, Johnny is propelled into horror-filled, supernatural experiences. Desperately, Johnny seeks seclusion, but a moral decision must be made — should he use his powers to change the future of mankind? Martin Sheen gives a chilling portrayal as a sinister, psychotic Senate hopeful aspiring to the U.S. Presidency. A good movie. Though I like the TV series better. For those of you, who know the TV series, but not this movie: It's essentially the plot of the pilot episode and the first season's Stillson story arc. And unlike the TV series, we have a proper resolution to the Stillson arc. Ironic is, that Martin Sheen, who plays Stillson whose ambition is to become President of the United States, later plays the president on West Wing. And Christopher Walken, whose character is talking about Sleepy Hollow and the headless horseman, will later play this character in the Tim Burton movie. Even though I don't consider it much of a special edition... only has 4 featurettes and the trailer. In the year 2019 an innocent man accused of a crime has a coice - Hard Time or Prime Time. He must pay or play The Running Man - the highest rated Television Show in history. It's a game between life and death but tonight the game is going to be different - Arnold Schwarzenegger is The Running Man. He's playing for a prize - the prize is his life. From now the rules are going to change... forever. One of my favorite 80s action flicks. A nice choice to get a real game show host for the role of Damon Killian. Though I think I will replace this release, when a Blu-ray release comes out. The DVD has non-anamorphic video and only stereo sound. 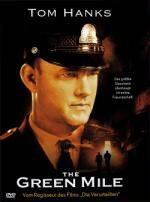 Like "The Shawshank Redemption", this one is written and directed by Frank Darabont. And it is another prison movie. This time with a touch of supernatural. This movie is great, but not as good as Shawshank. Michael Duncan Clarke had his big break with this movie, and this deservingly so. Clocking in with three hours, this movie is even longer than Shawshank, but this time it maybe a little too long. I had the feeling in parts, that it moved along a little too slow, but not disturbingly so. I only have one further Stephen King movie: "The Langoliers"
I am not sure, if I will watch it for this marathon. If yes, then not soon. Tomorrow I will go the sauna after work. On Tuesday I will go watch "Star Trek"
On Wednesday I will go to training and will not be able to fit a three-hour movie into the evening. On Thursday I will probably watch the next Bond movie for our marathon. And if the weather is good on Saturday, I will go to a barbecue. So if I will watch it, then probably on Friday. if you're not fond of gangsters or violence in general, bang goes The Godfather, Goodfellas and Pulp Fiction, and thank goodness it isn't black & white or subtitled. .
You can add Casino to this list too. Not as good than Goodfellas but almost, good performance from every actors (even Sharon Stone) and build in the same way than Goodfellas. I purposefully picked three films that have all been declared as absolute-must-see-no-matter-what. Casino is good, but it's never been mentioned before Goodfellas. I do think that Goodfellas marked the beginning of a downturn for Scorcese because Casino was his next film and it was virtually a remake. Actually you prove my point. Pulp Fiction is considered one of the greatest modern movies, but what do you do if you don't like the violence, or even Tarantino?